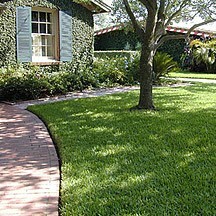 St. Augustine grass is a popular choice for many homeowners who desire a lush, green lawn. It's not hard to understand why with its dense growth, ability to thrive in hot climates and flat, thick blades that add a certain beauty and vibrancy to any yard. But despite its already high-maintenance care between mowing, watering, and fertilizing, you may be wondering how to make St Augustine grass thicker. Here are the top five tips to ensure your grass is growing to its full potential. Since St. Augustine is best grown by laying plugs or sod, it's important that the proper steps are taken to prepare the soil. A soil test is crucial in understanding the most appropriate fertilizer to buy based on its acidic content or "PH level." Additionally, proper grading is important so as to avoid pooling. Add topsoil to bare spots if needed to minimize water collection. This is especially important after installing sod for the first time. Initially, you'll follow a strict schedule of lawn watering several times per day during the first week. The following week, soak your lawn in up to half of an inch of water daily. Finally, scale it back to several times per week for another month so that at the six week mark, you can simply water as needed. Water only when blades don't spring back healthily when touched or when the grass starts to change color. These tips are quite simple: leave no less than two thirds of its length intact, mow with sharp blades, and don't bag the trimmings. Once the grass is firmly rooted and you begin a mowing routine, be sure the mower's cutting height is set between 2.5 – 3.5 inches. When researching how to make St Augustine grass thicker, pay close attention to proper fertilization. Nutrients vary by the bag, so use the label's nutrient analysis to guide you. Just remember the nitrogen – phosphorus – potassium ratio is listed in percentages, not pounds, so you must calculate the total amount needed. The rules of thumb advises one pound of nitrogen per 1,000 square feet of lawn space. Fertilize during periods of active growth as opposed to dormancy, usually in the spring and fall. While taking care of weeds may seem like an obvious action in the pursuit of healthy grass growth, there is still a right and wrong way to do it. When possible, hand-pull sporadic weeds to ensure they are uprooted. If treated chemically, be careful not to purchase a non-selective herbicide which, by design, kills all plant matter entirely. Essentially, a healthy, well-kept lawn of St. Augustine is the best defense against weeds and will eliminate the hassle altogether. St. Augustine is certainly not a low maintenance species, however, the final result of your hard work is a beautiful lawn, rich in color and development. Exercise patience and don't stress over how to make St Augustine grass thicker; just be diligent in following its care instructions and your yard will take care of itself. Over time, you will get to know your lawn and find a "sweet spot" in maintenance through trial and error. Our team serves customers throughout Arizona, including Phoenix, Mesa, Tempe and Tucson. Browse our website for information and tips on how to create and maintain a beautiful lawn, or give us a call and talk to one of our sod specialists at 480-456-1199 if you don't find what you are looking for. Better yet, stop by and meet the team at our convenient Chandler location.